Swim caps do tear. It’s unfortunate but it happens to everyone at some point. It’s not so much the cost of buying a new one that is annoying because they are pretty inexpensive. It’s more about the inconvenience of when and where they tear. It’s always when you least want it to happen. Why do they tear though? Well, there are different reasons why they tear. It could be the quality of the material they are made from, or how old they are, or how they are cared for and how they are put on and removed from the head. The question is, how can you prolong the working life of your cap? The first reason that they can tear is dependent on the material from which they are made. For many years, latex was the material that everyone used and it was the best product for that time. A decade or two ago, silicone was introduced, mainly because it is hypoallergenic and it doesn’t cause allergic reactions as does latex, and to those swimmers with latex allergies, it was a great benefit. 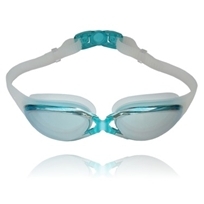 However, swimmers soon realized that silicone had other benefits too and they started moving over to them. Now, the silicone that is used to make the caps is high grade and they are much more tear resistant. Having said that, if the latex ones are cared for properly, they can last for a year or two. Silicone has a very low chemical reaction to pool chemicals and uv rays, additionally they don’t promote microbiological growth such as mold, this means that they won’t deteriorate as quickly as latex and won’t go brittle. 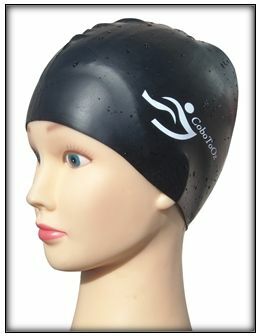 As a general rule though, silicone swim caps do last much longer than their latex counterparts, so for longevity, go for a silicone cap. Therefore the age of the cap can have a bearing on if it is more likely to tear or not. Besides getting brittle, just general wear and tear can make them more liable to rip. 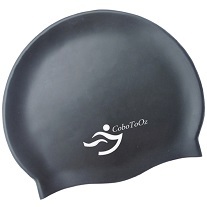 Another reason why swim caps may tear is the way they are looked after at the end of the swim. What most swimmers do is just wrap the cap in a towel or put it in a bag and leave it. This is not ideal for a couple of reasons. First of all, the chemicals in the pool or perhaps the sea water will leave a residue on the cap and when it dries out it can cause the cap to adhere to itself. When you try to unravel it at the next swim, it can tear. Added to this is the build-up of mold and other microbiological growth which will also weaken the cap, mainly the latex ones. What you should do to prevent this is after the end of your swim is remove any residue by rinsing it with clean fresh water, not the pool or sea water, then simply dry it with a towel. Once it is dry, to prevent it from adhering to itself, it is a great idea to sprinkle the cap lightly with a talcum powder, baby power is best because it is very gentle. If you can, neatly fold it away in a dry bag or container and when you get home, put it somewhere that is dry and not too hot or cold. You may not think that this will not make a difference, but it definitely will, particularly to latex caps. Another reason why they rip is if they are caught on a sharp object. So it stands to reason that you should store them away from such items in your swim bag or at your home. Catching them on your fingernail is another object that can regularly cause them to tear. This brings me to the resolution of how minimize this problem from happening. You can find out how to do that by visiting – tips on how to put on a swim cap.